Authentic bagel recipe: You need barley malt syrup and boiling water. When I was young and innocent, this was the setup to my favorite joke. (The punchline: “A stick.”) Now that I make my living as a cooking curmudgeon, the first answer that comes to mind is barley malt syrup, the ingredient that makes bagels bagels. Barley malt syrup is the stickiest substance I have ever personally encountered. When you pull a spoon out of a jar of it, that dangling thread of syrup remains unbroken for far longer than you think it will. It’s like Donna Summer singing that sustained, seemingly unending “up” in “Dim All the Lights.” In other words, when you buy barley malt syrup (which you will likely find at your local health food store), expect to get it all over your fingers, countertops, and possibly your floor. So what makes a bagel a bagel? As previously mentioned, it has to contain barley malt syrup. Sugar, honey, and molasses are simply no substitutes for this complex, not-particularly-sweet, tar-like substance. A bagel also has to be boiled before it is baked. 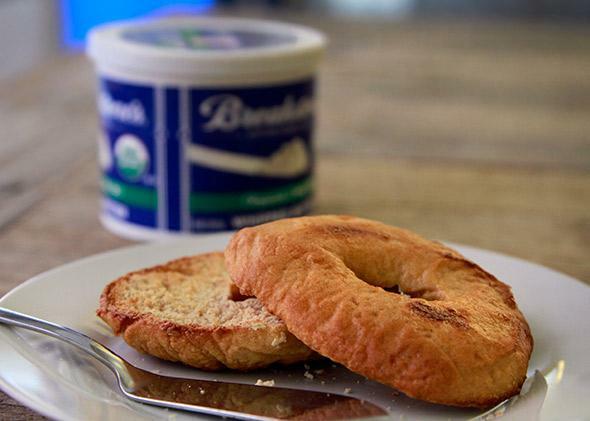 Boiling is what gives bagels their characteristic hard, chewy exteriors. Brushing the unbaked dough rings with water before baking them will not accomplish the same thing, and neither will steaming. You must actually submerge the bagels in simmering water for at least a minute; they will darken slightly, and their outsides will become far less pliable, close to the texture of undercooked pasta. Purists say that bagel dough needs to rest for a day before you shape and bake it, and they’re right. But if you simply must have bagels today, you can get away with giving the dough a quick rise, even though the crumb will leave something to be desired. Purists also say that the proper way to shape bagels is to roll a piece of dough into a long rope and then to connect the ends of the rope to form a ring. You are free to do this, but I always find that the ends of my ropes don’t adhere to each other very well and sometimes disconnect during the boiling process. It’s quicker and easier to just punch a hole in a ball of dough with your thumb. The resulting bagels look a little ragged—excuse me, rustic—but I’m eating these bagels, not entering them in beauty pageants. If you want to sprinkle sesame seeds or everything bagel topping on your bagels before baking, brush the boiled bagels with a little beaten egg white beforehand—the albumen will help the topping stick. 1. Combine the flour, yeast, and salt in a large bowl. Add 1½ cups warm water—about the same temperature as the inside of your wrist—and 2 tablespoons of the barley malt syrup. Stir with the dough-hook attachment of a stand mixer or by hand until combined. 2. Knead the dough with the dough-hook attachment of a stand mixer or by hand until it feels smooth and elastic, about 10 minutes, adding flour as necessary to keep the dough from sticking. Grease a large bowl (it’s fine to use the same one you mixed the dough in), add the dough, and turn it over to coat it lightly with oil or butter. Cover the bowl with a clean kitchen towel or plastic wrap, put it in a warm place, and let the dough rise until doubled in size, at least 1 hour and preferably overnight. 3. Grease a baking sheet with oil. Punch down the dough, then scoop about ⅓ cup of it into your hand, shape it into a 4-inch ring, and put it on the baking sheet. Repeat with the remaining dough. Cover the baking sheet with plastic wrap, put it in a warm place, and let the dough rise until doubled in size, about 1 hour. 4. Heat the oven to 425°F, and put 6 cups of water in a large pot over high heat. When it boils, add the remaining 2 tablespoons barley malt syrup and adjust the heat so it simmers steadily. Add three or four of the bagels to the boiling water and cook, turning once, until they are firm and golden, 1½ to 2 minutes. Remove the bagels from the pot with a slotted spoon and return them to the baking sheet. Repeat with the remaining uncooked bagels. 5. Bake the bagels until they are evenly browned, 25 to 30 minutes. Serve warm.